BALTIMORE — Amid a devastating attack that killed five people at a historic Maryland newspaper, journalists at the paper took to social media to seek help and report on the fatal shooting. In the immediate aftermath of Thursday’s shooting, they identified who was safe and voiced their first waves of grief. 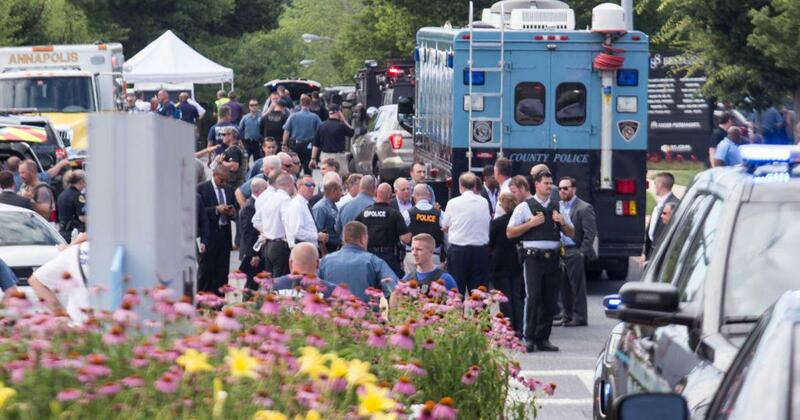 News of the Thursday massacre began with a chilling tweet sent at 2:43 p.m. by a reporter at The Capital Gazette in Annapolis, Maryland’s capital. Intern Anthony Messenger told NBC’s “Today” show that he handed his phone to another reporter, who tweeted: “Active shooter 888 Bestgate please help us.” Amid the chaos, reporter Selene San Felice had the bearings to share the newsroom’s street address. In a subsequent tweet, Davis said he heard the sound of the gunman reloading what authorities later said was a shotgun. Photojournalist Paul W. Gillespie, who was in the newsroom when the attack began, tweeted that he was untouched physically but was “a mess” mentally. I am okay physically, so far, mentally I am a mess. I was inside. I am lucky to be alive. Please pray for my coworkers who were not as lucky as I was. We lost some truly great people today. I am in shock trying to process this horrible situation. Thanks for all the kind thoughts. At a time when journalists are frequently denigrated, Capital Gazette editor Jimmy DeButts tweeted after the attack to tell the public that the newspaper’s staff are guided daily by a “passion for telling stories from our community.” They do the work without any expectation of “big paydays,” he wrote. In a series of tweets, DeButts tried to explain what hardworking journalists actually do day after day.